We are huge pizza lovers in our home. In fact, every Friday night is pizza night so we’re usually picking up or making pizzas for the night. We used to do take out more but recently found a Homemade Pizza Dough recipe that changed the pizza game for us. Having that recipe down pat along with having recipes for perfect sauces (RED and WHITE), we’ve been making pizzas like it’s nobody’s business. 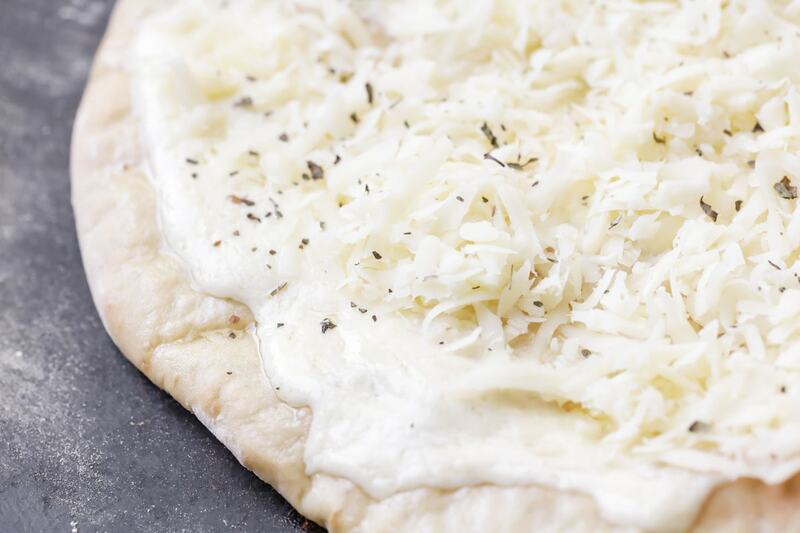 One of our favorite homemade pizzas is WHITE pizza (aka Alfredo Pizza). Have you tried it before? It’s amazing and so flavorful!! 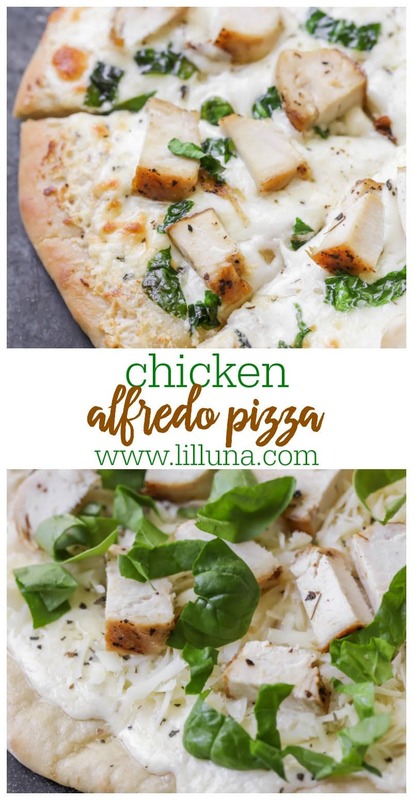 We love us some typical red sauce pizzas, but we love our Alfredo sauce just as much and have been making this Chicken Alfredo Pizza, which is to die for!! Although the recipe can be easily made using a store-bought pizza dough, homemade pizza dough is our favorite!! Our recipe is so simple and makes about 4 crusts. We like to make these earlier in the day so we can just add the pizza and toppings at night. Yes, we do love us some typical red pizza sauce, but our white sauce is so easy that we recommend it to everyone. Once that is made the rest of the pizza is cinch! Top pizzas with white sauce. Bake for 8-10 minutes or until crust is golden brown. 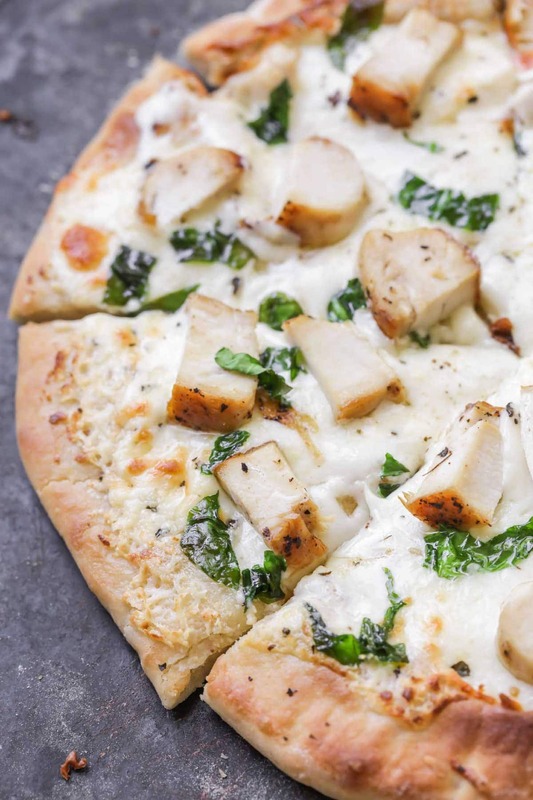 Oh boy we love this Chicken Alfredo Pizza!! 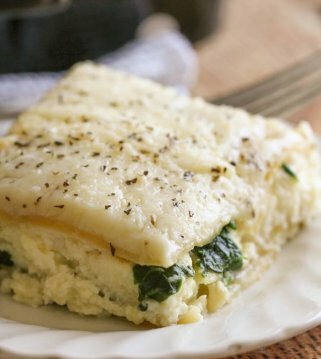 My kids have said it’s their new favorites and although they are a still a little leery of the spinach, they love this White Pizza. Give it a try and let us know what you think of it! 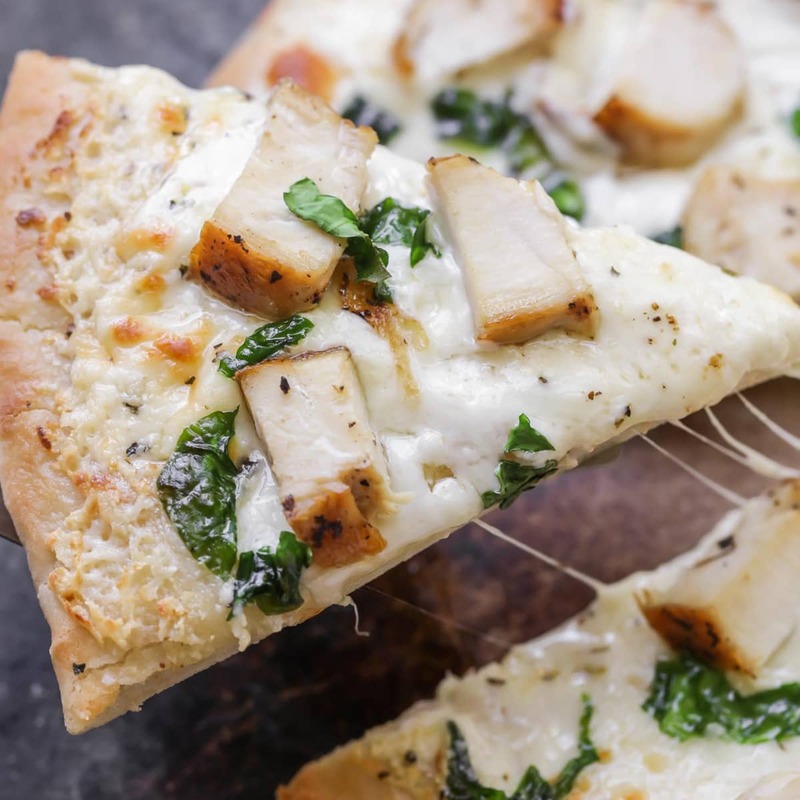 This Delicious Chicken Alfredo Pizza Is Made With A Homemade Pizza Crust, Homemade White Sauce And Is Topped With Chicken And Spinach. 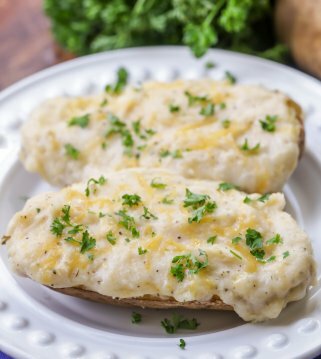 It’s A Great Alternative To Red Sauce Pizzas, Is Cheesy And Has That Delicious Alfredo Taste. 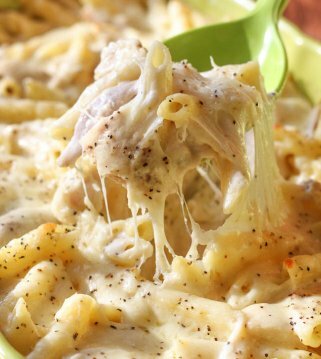 Make white Alfredo sauce by combining butter, heavy cream and cream cheese in a sauce pan. Simmer until melted and mix well. Add Parmesan cheese and garlic powder. Simmer for 15-20 minutes on low. Top pizza with sauce, Mozzarella cheese, chicken strips, chopped spinach and bacon. Bake at 450 for 8-10 minutes. 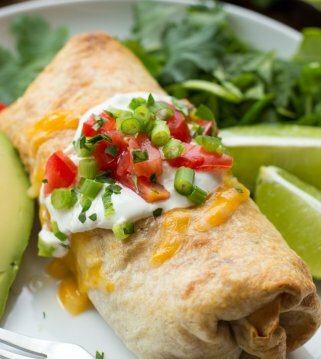 This recipe was originally published in March, 2015 by Lauren of Tastes Better from Scratch. Since then, the recipe and pictures have been updated. I love pizza, and this recipe looks spectacular! I followed this recipe exactly and I’ve been cooking for 30 years. I was embarrassed to feed this to my family. The sauce would not thicken. It was like pouring straight milk on the pizza. I let it cook a little longer before I put the second coating on and it still was so thin. The pizza came out soggy, falling apart and gross! I couldn’t bake it longer in hopes that it would thicken because the crusts were burning. This goes into my “Pinterest Fail” box! I’m sorry this happened to you! I’m not sure what went wrong, if you followed the recipe exactly?? I will pass this along to my contributor. Thanks for letting me know! 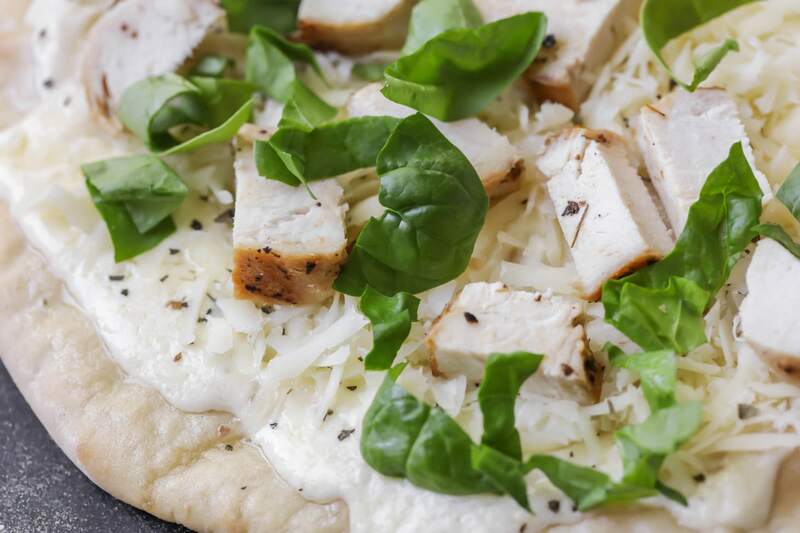 Chicken alfredo is my favorite, even better in pizza form! I agree!!! Hope you try this 🙂 Thanks! I can’t ever resist chicken alfredo anything, especially pizza! LOL..me either!! This was so delicious!! Thanks! That looks so good, I want to sink my teeth into a slice right now! This kind of pizza looks delicious! I always love spinach on a pizza. It does not only taste good, it is also very healthy. Yes 🙂 You will have to try this! It is so good! 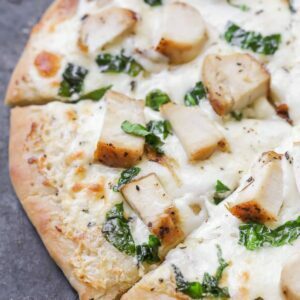 I love chicken alfredo and this pizza version of it looks amazing! It is!! You have to try it 🙂 I’d love to know what you think! Thank you for sharing the recipe! I love that there are some spinach on the pizza. Glad to share 🙂 The spinach tastes great on there! Thank you!